Define Irony! ABC’s news reporters got secret access to Apple’s top secret lab the other day. 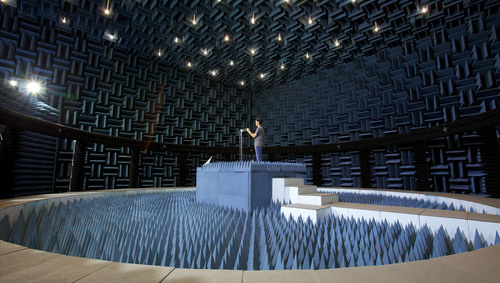 Apple calls this lab, the Antenna Lab where they test their new products from cell phones to iPad’s to iMacs. Apple said that it spend $100 million dollars in making this lab and had let reporters to show us how rigorously their devices are tested. A PR attempt to improve its image, may be but let us remind you Apple is one of the most secretive technology company around. Apple is notorious for its rigourous security practises and is noted for the level of secrecy it maintains. Below you will see the cell phone reception testing champer which has spikey walls where the cell phone reception is supposed to bounce off. Pretty impressive, next we have a dummy holding the phone. I pressume this is to understand the “death grp” issue. The next picture will actually show you how firm Apple believes in secrecy. As the reporter walks around, a desk with computers and macs is covered with a dark cloth. Even if we were to glance over it, it will be hard to make out whats on the desk but Apple doesn’t think so. Who knows may be its the new iPad 2 in the works? A $100 million lab yet the antenna issue persists. Define Irony!